for decades, if not longer. It's easy to see why people call it that. before it flowered in the year 1620." This is an heirloom if there ever was one. other years, it sports streaks of bright green. you will come to believe that plants do have personalities. 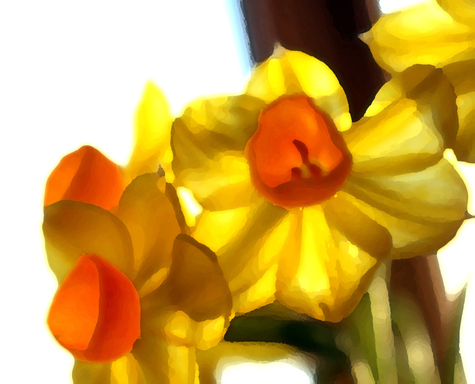 The other daff with its glorious glowing trumpet? from a bagged mix of unnamed bulbs i couldn't resist at the hardware store. "All ‘Van Sion’ bulbs sold in the US today are grown on a small island off the north coast of the Netherlands. There the climate is perfect for ripening bulbs which will bloom with all of the doubling neatly contained within the trumpet...No matter where you garden, that’s what you can expect to see the first year after you plant them, and that’s what most books and catalogs show you. But every spring after that, most of these bulbs will produce quite different blooms – shaggy powderpuffs with no sign of a trumpet, as you see in our photos here. And in some years or some gardens, these blooms will be heavily marked with green or they’ll open gnarled and imperfect. Though they’re weirdly charming, these mop-headed blooms are rarely pictured in books or catalogs. 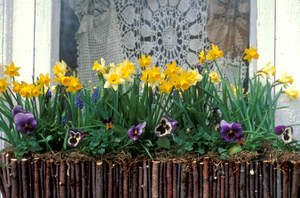 is the perfect vessel for these tiny daffodils and glories. that's a net bag of pine nuts i'm snacking on, next to the painted pitcher....mm, mm, good! where they last several days. while Valerie has multiplied, too, if not as robustly. a greater number of daffodil varieties than any other plant in my garden. and let them do their thing. Running through them just quickly, from memory, i count 18 varieties...so far. Both are considered heirlooms... the little marvel named N. x odorus ‘Plenus’, or Double Campernelle. As described by Scott Kunst, owner of Old House Gardens, "With dozens of petals neatly nested together as if in a perfect little rose — and just as fragrant — this tough little double daffodil has been grown and loved for over 400 years." The fascinating blooms point skyward and--when we aren't having a horrible heat wave--the blossoms are long lasting and make wonderful cut flowers to bring indoors. One of the most reliable, most prolific bloomers is pure white 'Thalia'. Again, from Scott: "Orchids or doves? With nodding flowers and soft white petals that sweep back dramatically from the cup, ‘Thalia’ may well remind you of both. With two or three blossoms per stem, it’s a strong, dependable grower ... the oldest garden form of the wild N. triandrus, and a definite classic." Thick flocks of this sweetie appear in my garden every year. most of Mr. Winkle's flowers have attempted to form one. that grace the garden now. (the crocus hardly dare open). My little voice is certain it was influenced by the Queen in Her Palace, posting.